Bwindi Impenetrable Forest on one meter away from your veranda. It feels like you are invited into to home of the majestic mountain gorillas. But these gentle giants are not your host, just your neighbors, occasionally coming out of the forest to spend some time in our garden. This is what makes Gorilla Valley Lodge so special. Located on the border of the impenetrable forest and set on a steep slope the lodge has a truly unique setting. 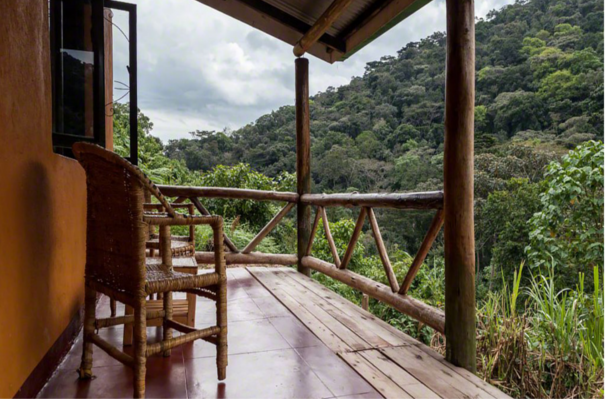 Imagine waking up with the sounds of the forest, having your cup of coffee or tea on you private terrace, experiencing the forest coming alive and the mist mysteriously giving way for a lush jungle.